Build capacity of Services and Advocacy for Gay, Lesbian, Bisexual and Transgender Elders (SAGE) to integrate their ongoing commitment to diversity and equity into programs, operations and culture with IAM Associates and Open Source Leadership Strategies. Working with the Funders Network on Population, Reproductive Health and Rights to develop an authentic partnership framework to support and model better collaboration that strengthens the movement. Worked with Diversity and Inclusion Team to assess current organizational issues and build staff’s capacity to align their policies, practices and culture to their value of equity. Worked with staff and consultant team to sharpen understanding of structural racism and apply the analysis to both internal dynamics and client work. Also provided coaching to the white caucus. Worked on a research and assessment process to conduct a qualitative study of the experiences of faculty and professional staff in their first two years of employment at ISU, and evaluate and recommend recruitment and hiring policies, procedures and practices with respect to diversity. Working with Shiree Teng and Brigette Rouson to build the capacity of Provide to align policies, practices, and processes with their values of diversity, inclusion and equity. Working with Diane Goodman and Michael Funk to support the executive team of Queens Legal Services to continue leading the equity change process. Worked with Sally Leiderman, Center for Assessment and Policy Development and Gwen Wright, Change Matters, to conduct an assessment and build capacity of agency’s Diversity Team to address racial disproportionality. The process included: identifying promising practices in the broader child welfare arena, conducting a needs assessment (survey, in-depth interview and focus groups of staff and service users), and designing and facilitating skill-building workshops and individual coaching. Provide design support and case study development for PRE’s Racial Justice Funders’ Lab. The Lab is a two-day session with a select group of foundation leaders to build a collective knowledge base and provide support to philanthropic leaders addressing issues of structural racism through grantmaking. Served as project manager for a pilot project with Philanthropic Initiative for Racial Equity and Race Forward (formerly, Applied Research Center) using their Racial Equity Grantmaking Assessment Tool with two foundations, the Barr Foundation and the Consumer Health Foundation. 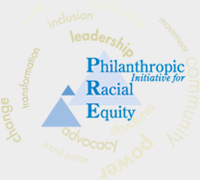 This tool was designed to share the benefits of being explicit about racial equity, and to determine the degree to which a foundation’s work is advancing racial justice. Conducted an assessment of the Evangelical Lutheran Church in America’s Synod Anti-Racism Teams (65 synods) to map the capacity, assets, and needs of the teams and network as whole to help create more effective collaboration with the church-wide office. Co-designed and co-facilitated a two-day national retreat with key leaders, and wrote the report, At the Intersection of Race and Poverty: An ELCA Capacity Building and Network Gathering. Served on the consulting team for the Leading By Example Initiative sponsored by California Tomorrow and Coalition of Community Foundations for Youth to build the capacity of four community foundations to address inclusion and equity issues.